Choose Exchange (or Office 365) from the Server Type pop-up menu, enter your Exchange email address and password, and click OK.
BusyCal enables you to share calendars with other Exchange users. Once each user has configured BusyCal to sync with their personal Exchange account, you can share calendars with each other through Exchange. When a calendar is shared through Exchange, events can be edited by any user and changes sync between them. 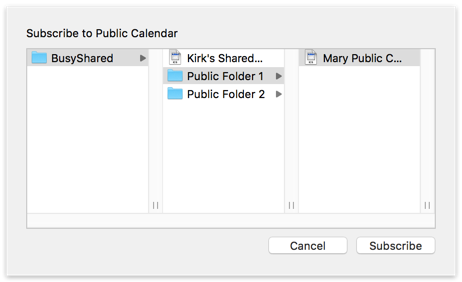 Calendar sharing involves two steps. First, the host must share calendars with one or more users. Second, the client must subscribe to the shared calendars from the host. Control-click the calendar in the left sidebar and choose Get Info from the contextual menu. Click the plus (+) button and then enter the Exchange email address of the person you want to share the calendar with. Choose the access privileges you want to grant them. Availability — User can view your Free/Busy time in the Availability Viewer but cannot view the details of the events. This option is available only for your primary calendar. Availability, Title, Location — User can view your event titles and locations in the Availability Viewer. This option is available only for your primary calendar. Read Only — User can view existing events but cannot create or edit them. Read & Create — User can view existing events and create new ones, but cannot edit existing ones. Read & Write — User can view, edit, and create events. Delegate — Same as Read & Write, plus user may create and respond to email meeting requests on your behalf. For more information on meeting invites when using Exchange, see Exchange Delegates. Click OK. An icon appears next to the calendar in the left sidebar indicating that it is shared. 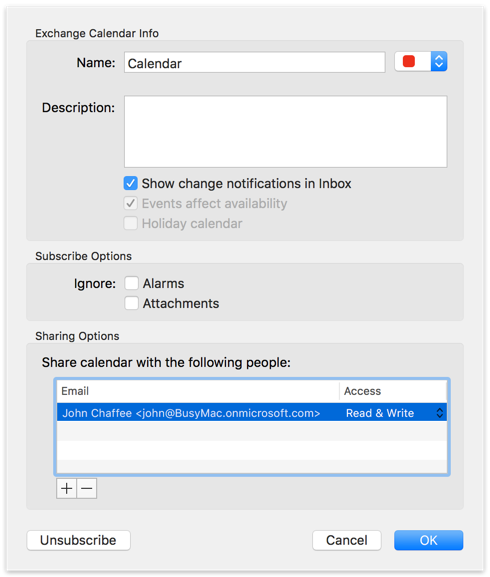 The person you shared with will need to add the shared calendar as described next. Note: To share a secondary calendar with someone, you must also share your primary calendar with them, with at least Availability access. Once you’ve granted someone Availability access or higher to your primary calendar, you can share secondary calendars with them. Choose BusyCal > Preferences > Accounts, select your Exchange account in the list on the left, click the Sharing tab, click the plus (+) button, and enter the Exchange email address of the user who is sharing calendars with you. The shared calendars then show up in the left sidebar, where you can subscribe to them by selecting their checkboxes. Exchange supports public calendars that can be shared with all users in an organization. Public calendars are created by your network administrator. In the browser that appears, navigate to the public folder that contains the calendar you want to subscribe to. Select it and click Subscribe. The public calendar appears in the left sidebar. 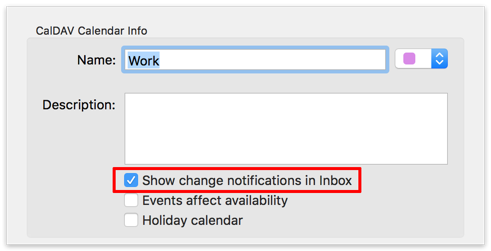 If you want to unsubscribe from a public calendar, Control-click it in the left sidebar and choose Unsubscribe from the contextual menu. 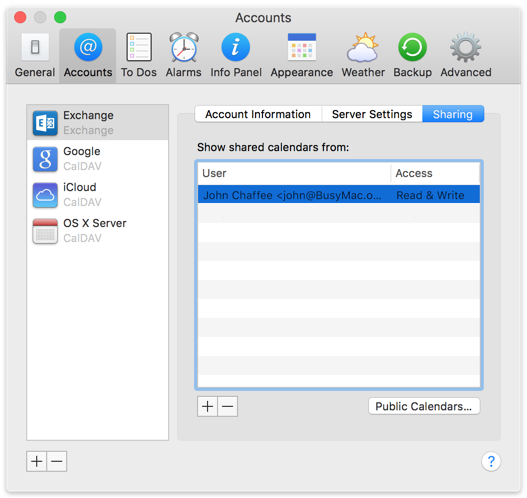 Exchange is a server that hosts your calendars and syncs them with client apps. 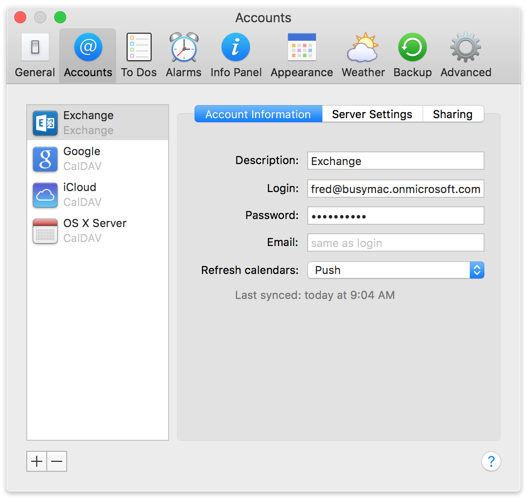 BusyCal, Outlook, and the built-in Calendar app on OS X and iOS are all client apps that sync with Exchange. 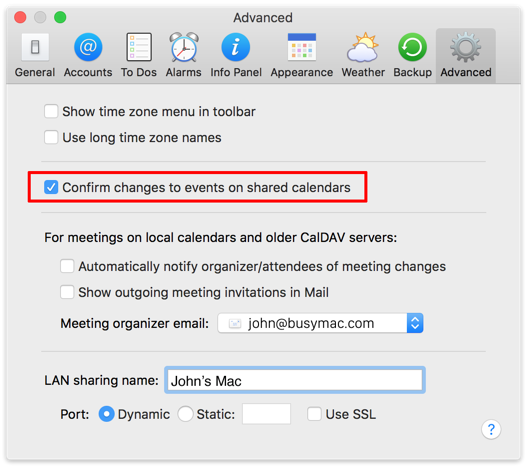 All calendars you want to sync between your Macs, iOS devices, and other users must be hosted on Exchange. 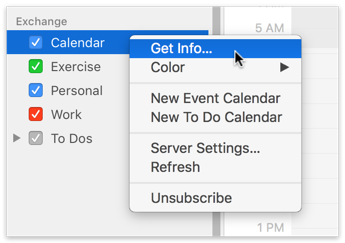 You cannot sync calendars from other sources (On My Mac, iCloud, Google, etc.) to Exchange. 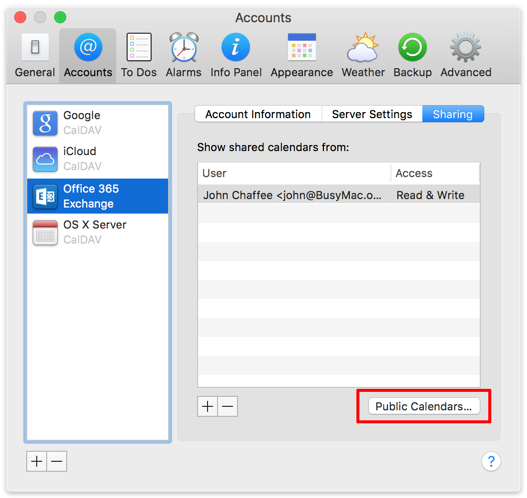 If you have any calendars hosted elsewhere that you want to host on Exchange, you can move them to Exchange or merge them with an existing calendar on Exchange. Choose File > Import and select the file you exported in step 1. If the “Import events into” section does not appear at the bottom of the dialog, click Options to display it. 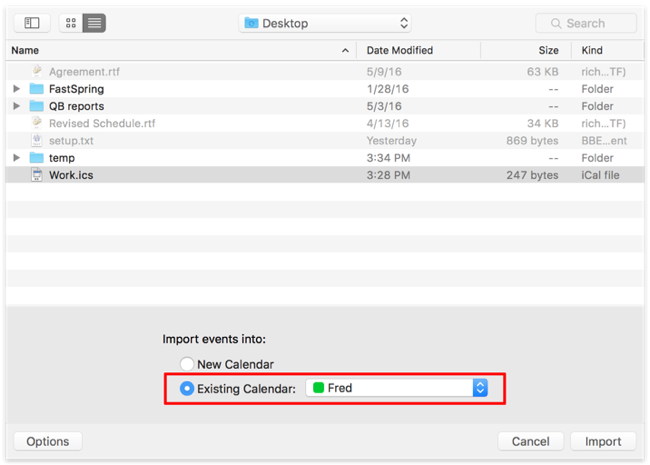 Select Existing Calendar and choose the Fred calendar (which is hosted on Exchange). 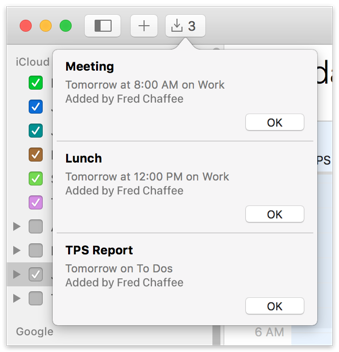 BusyCal adds the events from the Work calendar to the Fred calendar on Exchange. Note: If there are any to dos stored in the calendar you exported in step 1, repeat this process and import them into a to do calendar in step 2. Select the local Home calendar in the left sidebar, choose File > Export, and save it to your desktop. After successfully exporting the Home calendar, delete it from BusyCal by Control-clicking it in the left sidebar and choosing Delete from the contextual menu. Choose File > Import and select the file you exported in step 1 to import it. If the “Import events into” section does not appear at the bottom of the dialog, click Options to display it. 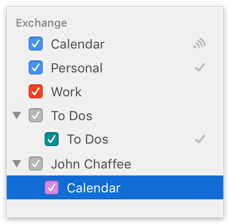 Select Existing Calendar and choose the Home calendar (which is now hosted on Exchange). BusyCal adds the events from the old Home calendar to the the new Home calendar on Exchange. 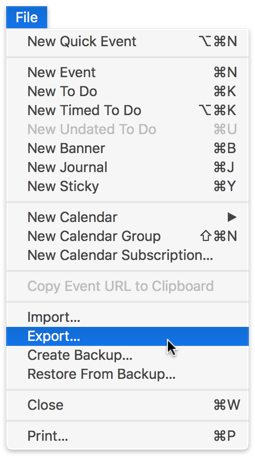 Note: If there are any to dos stored in the calendar you exported in step 1, repeat this process and create a new to do Calendar in step 2. Floating Times are not supported by Exchange. If you create an event in floating time in BusyCal, it appears in GMT time in other apps.